The Great Pyramids of Giza were built during an era where Egypt was considered as the richest and most influential civilization in the world. This unique structure reflects the distinctive role that a king or pharaoh played in the ancient Egyptian society. The people believed that their pharaoh was specifically chosen to serve as the mediator between men and the gods. Thus, it is important to keep the pharaoh’s body intact after his death. These pyramids served as burial grounds for pharaohs, and since the people believed that the king’s spirit remained with his body, proper care was important. The corpse was preserved through mummification, and all the things that the pharaoh needed in the afterlife were buried with him. These included furniture, food, gold vessels, and other precious offerings. The early pyramids became the resting place of the king who was supposed to continue his existence even after death. The riches that were buried inside the structure also provided for the pharaoh’s relatives, priests and relatives who were also buried near him. The oldest know pyramid was constructed around 2630 BC, and it was for King Djoser. The builders assembled stepped layers of stone and not mud-brick which was commonly used during those era. The first pyramid reached a height of 62 meters. It was graciously surrounded by temples, courtyards, and shrines, where King Djoser was to enjoy his afterlife. These pyramids were strategically built at the western bank of the Nile River. They were constructed for King Khufu who ruled the country for 23 years (2589-2566 BC). Despite the grandeur of his pyramid, little was known about his reign. 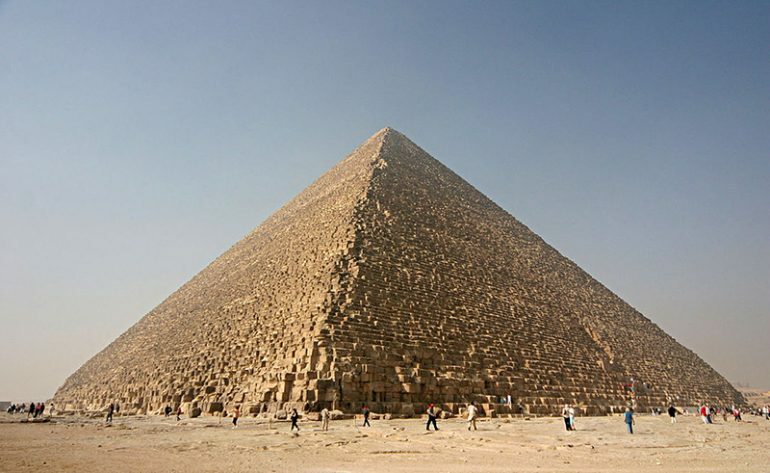 The sides of the largest pyramid’s base had an average of 230 meters and its height was measured at 147 meters. Three small pyramids were built for King Khufu’s queens and the structures were lined up beside the largest one. Similar to other pyramids, Khufu’s tomb was surrounded by several rows of mastabas or special tombs for the King’s officials and relatives who will support and accompany him in the afterlife. Another pyramid was built for Khafre, King Khufu’s son. This is where the Great Sphinx was built. It’s a guardian statue that was carved in limestone. It showcases a man’s head attached to a lion’s body. 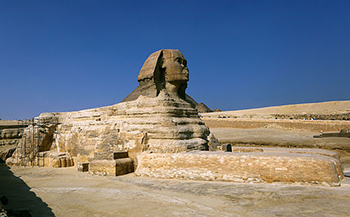 The sphinx is known to be the largest statue ever constructed in the ancient world. It has a measurement of 20 meters in height and 73 meters in length. People continued building pyramids until the 5th and 6th dynasties, but like the Berlin Wall, there came a time when people stopped putting up these structures. Over time, the scale and quality of these structures declined along with the wealth and power of the kings. The last to be built was the pyramid of King Pepy II (2278-2184 BC). Pepy came into power at a very young age and ruled for 94 years. During his rule, the prosperity of the Old Kingdom greatly dwindled and the pharaoh even lost his quasi-divine status. The structure was much shorter at 172 feet. After the death of Pepy, the Kingdom along with its strong central government collapsed. A turbulent phase rocked Egypt and it was clear that the days of excellent pyramid building was finally over. Today, most of the bodies as well as other funeral goods from the pyramids were removed and the exterior walls have even been plundered. The Great Pyramids have also lost its original height. Khufu’s pyramid now measures 137 meters in height. Nonetheless, millions of local and international tourists still flock to Egypt to visit the pyramids.